Thanks to the folk literature, Jan Jiří Grasel becomes a brave man who "takes the rich and gives to the poor". He and his gang commit 205 crimes. He himself murders two people. He and sixty-six pals of his are sentenced in the end. The two of them - Ignác Stangel and Jakob Fähding - are executed in the Rossauer Barracks yard in Vienna the same day like Grasel. The "famous robber" is illiterate. His father, Thomas Grasel, used to be a bumble. However, he commits lots of crimes and thus he is officially branded as "a dangerous loafer". 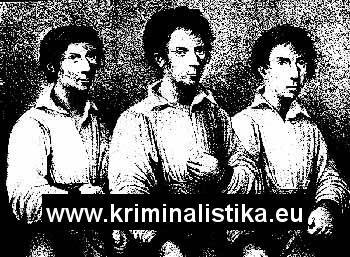 He is going time in Špilberk Prison, Brno, in 1792 - 1809. His mother, Regina, is arrested in 1801. At the age of nine, Jan Jiří Grasel is sentenced to a whipping and a fourteen-day imprisonment for pickings and stealings. The sixteen-year old Grasel and his pals commit their very first housebreaking in Raabs, Austria. His share in the haul is rather deplorable: two bed sheets and a blue bedcover... Six years later, in June 1812, he murders Michael Witzmann, an innholder from Obergrünbach. The cruelty is the main attendant phenomenon of Grasel's gang. 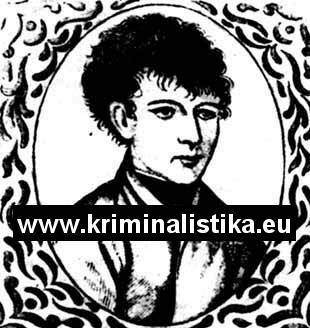 He and Jakob Fähding break into Anselm Lamač vicarage in Matějovec, near Český Rudolec at night, on May 13th, 1814. The noice wakes the vicar up. Grasel and Fähding beat him up. While Fähding keeps on beating the vicar for the following thirty minutes, Grasel seeks through the house and steals a ducat, a watch, some clothes, some silver spoons and some food. A few days later, in Zweitl, Grasel breaks into a sixty-six-year old Anna Marie Schindlerová's house. As she refuses to tell him where her money is, he beats her to death with an iron rod. The range of Jan Jiří Grasel and his gang action is extremely wide at that time. He commits his crimes not only in Austria, in Gmund, Raabs, Zweitl and Ober Hollabrunn, but in the Southern Bohemia, Southern Moravia, in Chlum u Třeboně, Nová Bystřice , Slavonice, Dačice, Jemnice and Znojmo. Grasel and his pals are a gang of theaves, housebreakers and robbers. Merchants, craftsmen, millers and farmers are their victims. His biggest plunder derives from Loidolt, from a merchant living in Grossiegharts, Austria. He steals the goods worth 5.343 gold nuggets there. The merchant gives him only 300 gold nuggets. But Grasel does not give the money to the poor, but he feasts the money away. Grasel and Jacob Fähding break into a tannery in Nová Bystřice in November 1814. Grasel finds 30 gold nuggets there and goes halves with his fellow. By the way, he finds 100 more gold nuggets there, but he keeps the money to his delight of it... He does so again. Grasel and his pals become a real danger to the commons. In 1815, Grasel a pal of his, Zottl, decide to buy a bottle of gin and thus they go to a local shop in Studnice, near Jindřichův Hradec. He is recognized by the local people. There is a crowd of enraging people waiting for him in front of the shop. They want to commit him for trail. Zottl is caught, Grasel manages to escape. In November 1815, a four-thousand-gold-nugget reward for recapturing Jan Jiří Grasel is announced in Bohemia, Moravia and Austria. The police notice writes if a pal of Grasel's helps to catch Grasel, he is promised to get a half of the reward and to become nonpunishable. 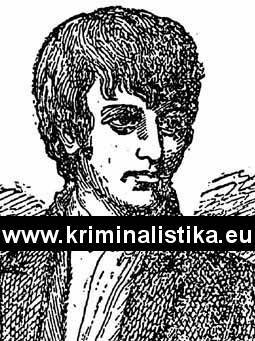 If anyone suppresses the information about Grasel and his gang, or if anyone even helps him to cheat the justice, they will be sentenced to hard labour for three or four years. Those who contribute to arresting Grasel will be rewarded 500 gold nuggets. The arrest order includes a minute description of Grasel. Jan Jiří Grasel is caught thanks to Mr. von Okacz, the President of the Brno Police Department, who sets a trap for him. A David Mayer and a Penkhartová, the former thief, team up with him. 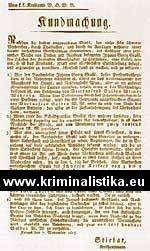 Both of them are taken to Drosendorf prison. Terezie Hambergerová, a mistress of Grasel's, is doing time there. Mayer puts up an escape from the prison which gains him her overweening confidence. She arranges meeting Grasel for him. 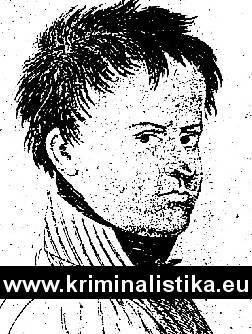 Grasel is arrested under a rather dramatic circumstances in a pub in Martersdor, Austria, on November 18th, 1815. Grasel puts up a resistance. But the local barflies help Mayer overcome Grasel's resistance. Grasel is put to a special cage which is made of iron rods and taken to criminal court in Vienna. The police investigations of crimes committed by Jan Jiří Grasel and his gang take more than a year. Grasel's statement itself amounts to 568 pages. 214 people are involved in the criminal case called "Grasel and Co.". Several suspected die in custody. Finally, the Vienna criminal court sentences fifty-nine criminals to multiyear penal servitudes or hard labour. Grasel and seven more criminals stand upon the military court as they are deserters. The three of them: Jan Jiří Grasel, Ignác Stangel and Jakub Fähding are sentenced to hanging. The execution of Johann Georg Grasel (also known as Hansjágr or Niklo) and the two pals of his takes place in public, early in the morning, on January 31st, 1817. The military court's sentence is printed in 15,000 copies. The Army Council receives 1,4000 copies and 150 copies are handed out before the execution begins. The rest is sold out in favour of the blind orphans, 10 Kreutzers per copy. David Mayer is rewarded 4,000 gold nuggets and 2,509 gold nuggets as an expense compensation. He is said to become a brewery-master in Slavonice. Penkhartová gets 400 gold nuggets from the emperor. Mr. Vollmost, a cannoneer, has the biggest interest in defeating Grasel in the pub fight and thus he is rewarded 130 gold nuggets. Four villagers get 30 gold nuggets. The name Grasel [gra:zl] is known and used not only in Bohemia and Moravia, but in all the German speaking countries too. It means "a blackguard".